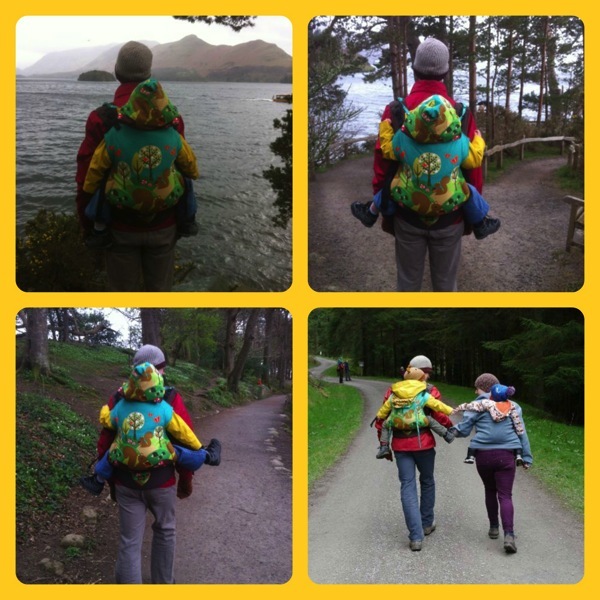 As it’s International Babywearing Week, I thought I’d write some more about our experience of baby wearing – or these days I should say toddlerwearing and preschoolerwearing. I’ve written blog posts before on our babywearing experience – you can read them here and here if you’re interested. I’ll cover some of what I wrote there here too. Like many parents who baby wear, we started out with a narrow-based high street carrier, the Baby Bjorn. I’m sure most parents have seen this or similar carriers in shops selling baby stuff. It was OK for the first few months, I liked being able to carry Andrew close to me, but it soon became uncomfortable for me and something about it just didn’t feel right. But I didn’t know of alternatives, that’s all I could see in shops and what was obvious online, so we left babywearing for a while. Then by the time I was pregnant with Joel, knowing there would be a 21 month age gap, and I really didn’t want to buy a double buggy, I decided to do some more research. I’d vaguely heard of the Cambridge sling meet, so looked it up and went along one morning. Well, I was amazed at just how many different types of slings there were. Everything from big long pieces of woven fabric (or wraps), to buckled carriers (which were far more ergonomic for baby to sit in than our BB as they had a wide base), and lots in between like mai teis with a panel like the buckled carriers but with big long straps to tie like the wraps. I knew straight away that these looked far more promising than what we’d previously used. When I know where to look online, and the right ‘key words’ – like ‘babywearing’, I hadn’t actually heard it called that before – I found much more information and a range of options, new and pre-loved, to buy. I ended up buying a stretchy wrap for when Joel was born. This was a fantastic starter wrap, for someone who had never wrapped before. Ours was a Moby, but there are other brands too. I just liked the pattern on the one I bought. At first tying the wrap seemed tricky, but after doing it several times a day I soon got used to it and it became automatic, like tying a shoelace. 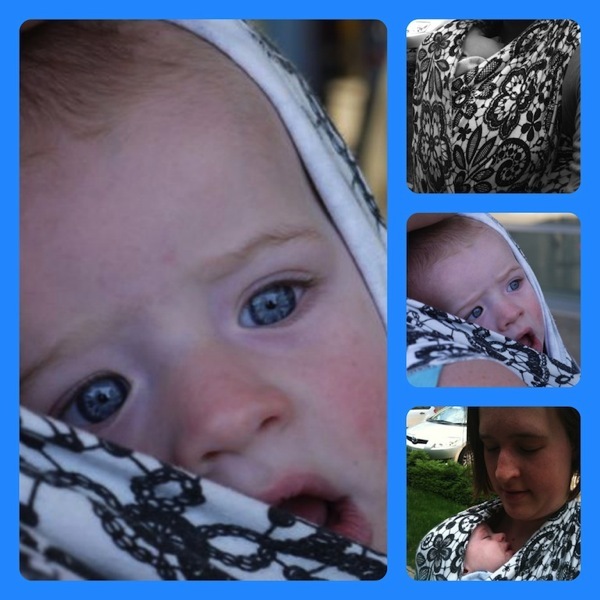 Joel went everywhere in that wrap as a baby, it was so useful being able to keep him close to me whilst also running around after a toddler. I don’t know how I would have coped with a newborn and toddler without it really. By the time Joel was 6 months, the stretchy wrap wasn’t supportive enough. I tried a few woven wraps via the sling meet, but Joel has always been very fidgety and it just seemed to be getting more and more difficult to wrap him up quickly like I could when he was smaller. 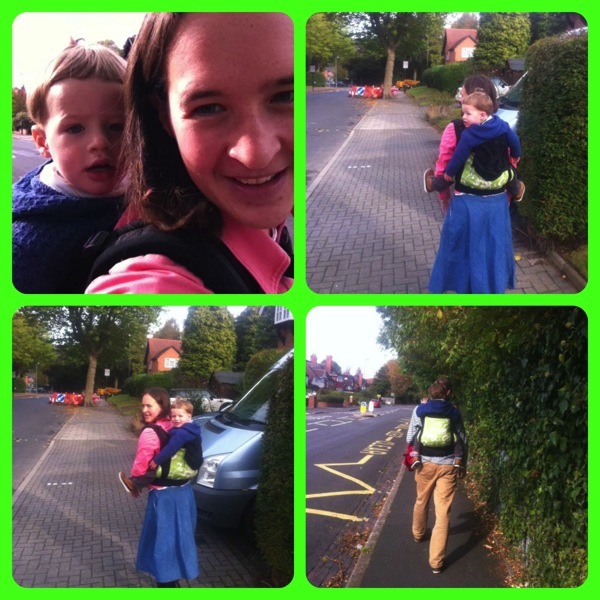 So I decided to buy an ergonomic buckle carrier – the Rose and Rebellion baby carrier – which was fantastic for getting him into quickly. I also needed to be able to do this outside, like in the muddy park, which I found difficult with a wrap because it trailed on the floor, whereas the buckled straps were much shorter. 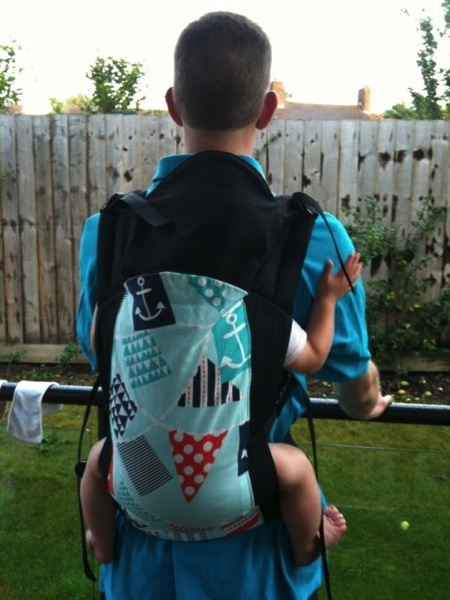 Then Joel’s long legs got too big for the R&R, so I bought a similar toddler carrier, one which had been made by a work at home mum, converted from the fabric of a long wrap. This has been so comfortable and we’ve used it almost daily until now, when it’s getting a little on the small side again. Our buckled carrier is what we use when we’re out for longer periods, walking to a group, going into town or out on a walk. Another type of sling that I hadn’t really thought about until I found out more about them was a ring sling. This is a fantastic way to carry Joel (or Andrew) on my hip while still having my hands free. We use this around the house if he’s being clingy, and most often if we’re doing quick ups and downs when out and about, for example if we drive somewhere and then walk a bit here and there at the other end, and also if walking 10 minutes to the very local shops, which Joel will mostly walk now, but if he gets tired I can quickly give him a more comfortable carry than without the sling just in my arms. Or if I have both boys on my own and it’s safer to have one attached to me and the other on the reins when we walk along a busy road, then the ring sling is very handy. I’m so glad I bought a couple of these slings, these really do make daily life easier. Since owning a toddler carrier, I’ve realised that it really is comfortable, something I was sceptical of when I first started wearing Joel, and that I can carry a child of quite some weight extremely comfortably, more comfortably than if I carried them in my arms, which all parents of toddlers must find themselves doing from time to time. When I started wearing Joel in the stretchy wrap, I never imagined that I would still be carrying him now. I thought it would be hard and only ‘supermums’ or strong dads do that kind of thing. But I think because his weight has built up slowly over time, my own muscles have adapted to that and with a good fitting carrier, I don’t feel his weight pulling down on me. 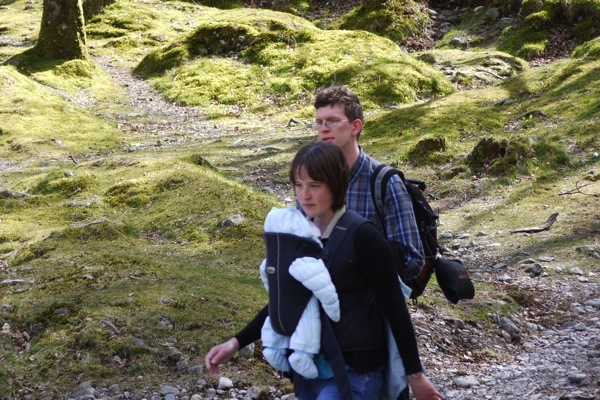 With this realisation came the realisation that it would also be practical to have a sling for Andrew, a preschool carrier designed for a child with legs as long as his, to keep their hips in an ergonomic position. So I bought one from a popular work at home mum in Poland who makes excellent quality slings – Madame Googoo. It got to a point a few months ago that I found Andrew far too heavy to push in the buggy, and when he was too tired to walk, I preferred to carry him and push Joel, so my default way of transporting the two boys has changed: when they were younger I tended to push Andrew and carry Joel. 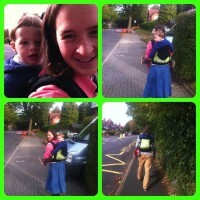 Having a preschool carrier has made getting out and about with them both on my own easier now that Andrew is so big. Of course he walks quite a bit, but we do a lot of walking and the kind of distances mean that he can’t always manage to whole journey without a rest. My most recent purchase, to replace the wrap conversion toddler carrier that’s a little too small for Joel to keep his legs in a good spread position, is a Tula buckled carrier. I also love all the different designs on woven wraps, even though with the boys we never got to own any because wrapping got impractical just as we got to a stage of wanting to try woven as opposed to stretchy wraps. So my plan for this Tula is to cover the green bit (which isn’t my favourite colour) with a piece of woven wrap material that I love – it’s arriving later this week from Germany. 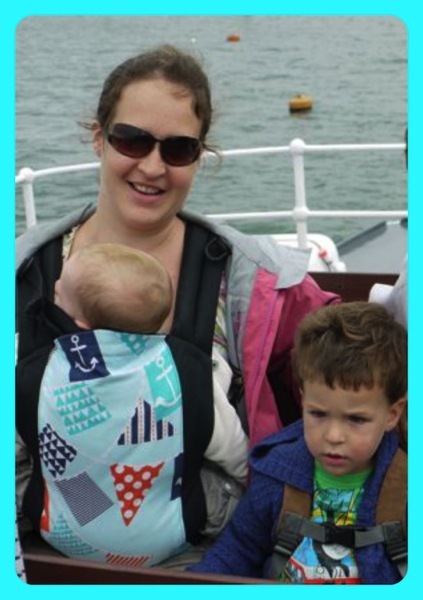 This is my treat for me in International Babywearing Week 🙂 You see our slings aren’t just practical, they are beautiful and funky items of clothing too! You may be thinking that this is a lot of slings to own, and isn’t it expensive to buy this many?! 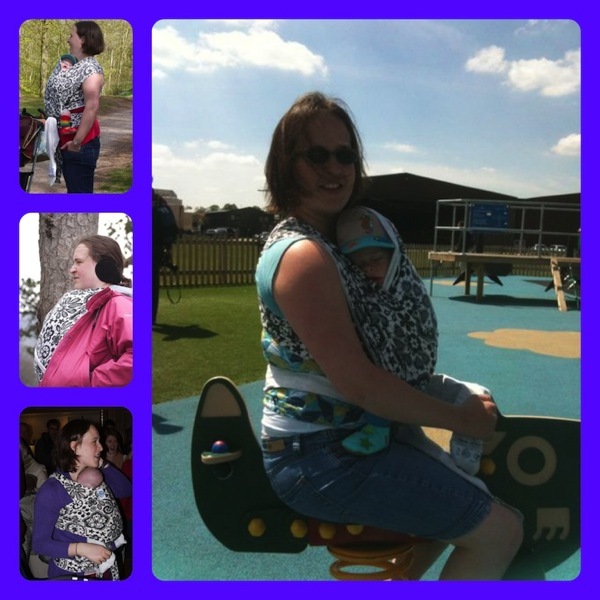 A great thing about slings and wraps is that they usually have a fantastic resale value, so once I’ve sold them again (as I have already with our baby wrap and buckled carrier), I haven’t actually spent a lot of money at all on each one – around £15-20. In comparison, buggies don’t hold nearly as much value as this when sold second hand. I’m not entirely sure when our baby/toddler/preschoolerwearing days will end, but I expect that both boys will still want to rest their legs a while from walking for quite a time to come. 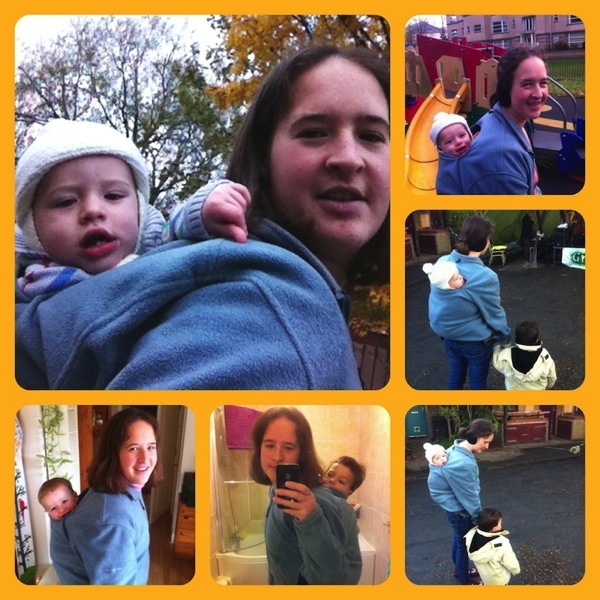 I get quite a few comments when out and about wearing them along the lines of “aren’t they too heavy/old for that?” or “doesn’t it hurt your back?”, which to be fair is what would have been going through my mind before we actually got into babywearing, but I usually reply with something along the lines of “I find it easier on my body than pushing a heavy buggy”. Everyone is different though, and I’m sure for some people pushing a buggy is easier than carrying, for all sorts of physical reasons. This is just our experience, and one that I like to share, because like me a few years ago, I believe there are many parents out there who just don’t know of this as an option. If you have any more questions, I’m always happy to talk about slings and things, so drop me a line. Hello, thanks for a detailed post, helpful for those of us who have not been baby wearing for too long. I got somewhat confused with which carrier detail when with which picture and carrier name. Is the blue jacket a carrier or just a jacket for a carrier. I so wish each picture was directly labelled with the name of the carrier. I will just have to read through again and see if i can ‘disentagle my confusion’. Thanks for sharing your experience, it is helpful. Sorry, yes this post was written very quickly. I just don’t have time to devote to the blog that I used to now that my business is keeping me busy. I’ll add some captions though, that won’t take long. But I felt I wanted to write something, even if it wasn’t the greatest piece! Hello Ruth, thanks so much for taking time to write your blog and even more to reply my comment. It’s lovely that your business is doing really well and I’m really pleased for you; indeed, it’s understandable that it has priority over the blog. I pray it’ll continue to grow from strength to strength.